Mosquitoes are important pests because their biting activity often interferes with outdoor activities and can transmit disease organisms to people and domestic animals. Most mosquitoes are active during twilight hours and at night; however, around the home, the mosquitoes that breed in discarded containers are active during the day. Mosquitoes need water to complete their life cycle. They can breed in almost any source of water. Pesticides are only a short-term solution to nuisance mosquito problems. 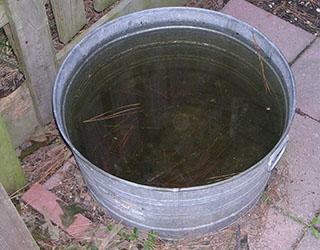 All mosquitoes need water of some sort to complete their life cycle (Figure 1). Some mosquitoes lay their eggs either individually or in "rafts" on the surface of the water. These eggs usually hatch within 24-48 hours depending on water temperature. Other mosquitoes deposit individual eggs on the sides of treeholes or discarded containers, or in depressions in the ground that will hold water. These eggs survive over the winter and can even lie dormant for several years and cycles of dry weather. Some eggs hatch when they are flooded by rainfall, but several flooding and drying cycles may be needed before all of the eggslaid by a particular female mosquito hatch. The hatching eggs release larvae that are commonly called "wrigglers" because you can often see the larvae wriggling up and down from the surface of the water. Most mosquito larvae feed on organic material as well as bacteria, algae and other microrganisms in the water. There are a few mosquitoes that are beneficial because their larvae prey on other insects including the larvae of other mosquito species. About 7-10 days after the eggs hatch, larvae change to the pupal or "tumbler" stage in preparation for adult life. Adult mosquitoes emerge about 3-4 days later and may feed first on plant nectar. Male mosquitoes mate with females one to two days after the females emerge.Female mosquitoes then begin searching for an animal on which to feed. Males do not bite; they feed strictly on plant juices. Figure 1. 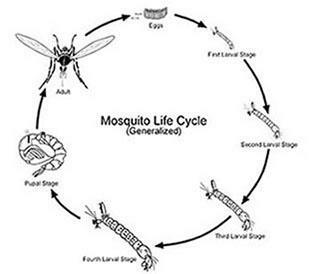 Mosquito life cycle. Since mosquitoes need water to complete their life cycle, the source of a mosquito problem can be just about anywhere that water can collect. Farm ponds and lakes are typically not major breeding areas for the mosquitoes that most concern us. Fish and predatory insects (such as dragonflies) in the water often keep mosquitoes in check. We can improve this natural control by keeping the ponds free of weeds, algae and floating debris where mosquito larvae can hide. Severe storms, such as hurricanes, can contribute to problems as well. 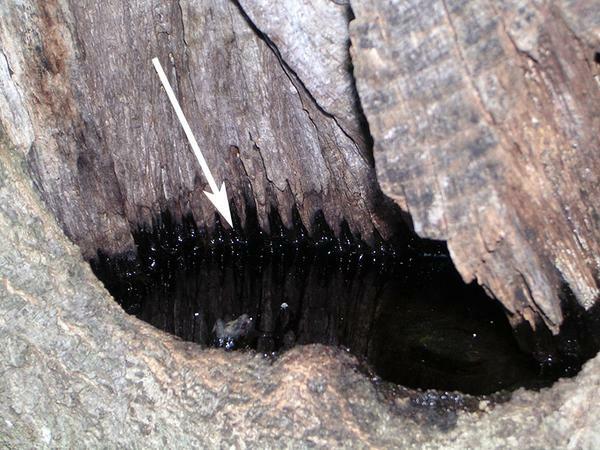 For example, tree limbs that break off can create holes in the tree trunks where water collects and allow mosquitoes to breed (Figure 2). In residential areas, human activity often creates mosquito breeding sites or promote increased mosquito activity around natural bodies of water. Clogged drainage ditches along roads can become productive mosquito breeding sites. Logging and construction activities often leave deep tire ruts and holes in the soil. These depressions are ideal breeding sites for "floodwater" mosquito species. Figure 2. Holes left by fallen tree limbs collect rain water and make an ideal habitat for mosquito breeding. Some mosquito species (such as saltmarsh mosquitoes) can fly several miles from their breeding site . The most commonly found mosquito species across North Carolina is the Asian tiger mosquito (ATM). It tends to fly short distances (100 - 300 yards) which still allows it to invade your property from surrounding areas in your neighborbood. Because of the mosquitoe's mobility, control on individual properties is often difficult. A more wide-area approach is needed and while pesticides are often seen as a solution to a mosquito problem, they are just one small component of an integrated mosquito management approach. Figure 3. Empty or get rid of containers that can hold stagnating water. Figure 4. 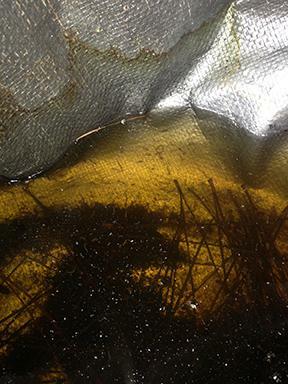 Mosquito larvae in stagnant water in a fold of a tarpaulin.